In Peoria, the average temperature during the month was 70.7 degrees, which was 4.4 degrees below normal. This was the coolest July on record in Peoria, breaking the old record of 71.2 degrees set in 1971. Daily record cool highs were set on the 1st (69 degrees), 18th (71), and 19th (73). The average temperature for Lincoln was 69.4 degrees, which was 5.6 degrees below normal. This was the coolest July on record, breaking the record of 71.3 degrees in 1924. Record cool highs were set on July 1 (70), July 17 (72), and July 18 (71). Lincoln tied a record low of 49 degrees on the 20th. In Springfield, the average temperature was 71.2 degrees, which was 5.1 degrees below normal. It was the 2nd coolest July on record, surpassed only by a 71.0 degree average in 1891. A daily record cool high was set on July 18th (71), while Springfield set a record low of 52 degrees on the 20th. Through July 30th, the average temperature for Champaign is 70.5 degrees (4.5 degrees below normal) and ranked as the 2nd coolest July on record. Daily record low highs were set on July 4 (67) and July 18 (73). It is interesting to note that no 90 degree high temperatures were reached at these sites in July. This only happened in one other year, 2000. The warmest day at Peoria was 87 (15th) and the warmest day in Lincoln and Springfield was 86, both on the 7th. 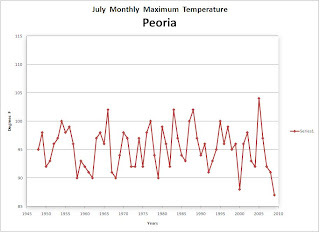 The coldest July monthly maximum temperature since 1948 was 88 in Peoria and Springfield, and 89 in Lincoln, all set in 2000. Champaign's highest temperature was 87 degrees (28th), Decatur was 86 (28th), Mattoon 87 (7th), Lawrenceville 88 (7th), and Bloomington 86 (15th). Central and southeast Illinois averages around a dozen 90+ degree high temperatures in a typical July. Rockford had the coldest July ever on record, running 2F colder than the previous coldest July on record. In Chicago, July 2009 will go down as the 7th coldest July on record. However...in 1942 the official recording station was moved away from the lakefront. If we look at temperature data from 1942 to present...the July 2009 average temperature of 69.4 would rank second coldest. The coldest July on record since 1942 was 69.3 degrees set back in 1992.